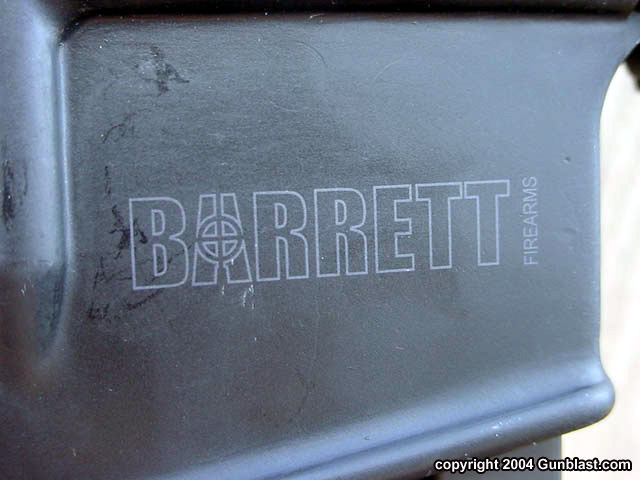 Barrett Firearms Manufacturing has been producing high quality semi-auto and bolt action rifles chambered for the .50 Browning Machine Gun cartridge for over twenty years. Their rifles are known worldwide, and are used by many units of the US military and our allies. 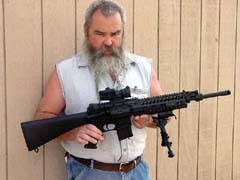 Ronnie Barrett is also responsible for a great amount of interest by civilians in the sporting use of the .50 BMG cartridge. Barrett big fifty rifles are used by many long-range target shooters, and Barrett has become the leading producer of .50 BMG caliber rifles in the world. Besides their constant production of .50 BMG rifles, Barrett is also working full time on several interesting projects for our military. They are developing a very high-tech sniper scope system that should totally eliminate guesswork and human error, and they have a twenty-millimeter rifle that defines the word "awesome". However, the subject of this article is their new AR-15 type rifle chambered for the equally new 6.8 Remington cartridge. 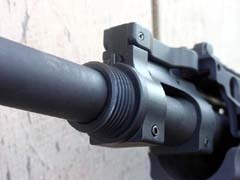 The 6.8 Remington SPC (Special Purpose Cartridge) was developed by Remington and the US military as a replacement for the 5.56mm NATO cartridge in specialized situations. 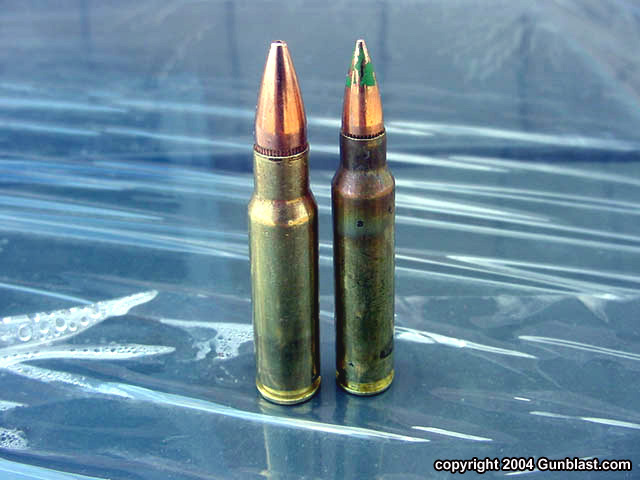 The cartridge is based loosely on the .30 Remington case, and uses a 115 grain bullet of .277 inch diameter. One of the parameters of the design was that it must be compatible with the M4/M16 family of rifles, along with current squad automatic weapons and light machine guns, with minimal modifications. The specifications call for a bullet speed of 2650 feet per second from a sixteen and one-half inch barrel, delivering 1715 foot-pounds of energy, and a six hundred meter effective range. Basically, the US military wanted a round that was smaller than the 7.62x51mm NATO cartridge, but delivered more terminal effect than the 5.56mm. The end result was the 6.8 SPC. Inevitably, there has been comparisons between the 6.8 SPC and the 6.5 Grendel cartridges. The way I see it, there is plenty of room for both cartridges. The 6.8 SPC is purpose built for antipersonnel use at close to medium range, offering more punch than the 5.56 NATO. The 6.5 Grendel is built as a long-range cartridge for extreme accuracy, and does excellent duty as a hunting cartridge for deer and like-sized game. 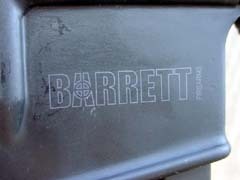 The weapon for delivering the new cartridge is being manufactured by Barrett at their Murfreesboro, Tennessee facility. 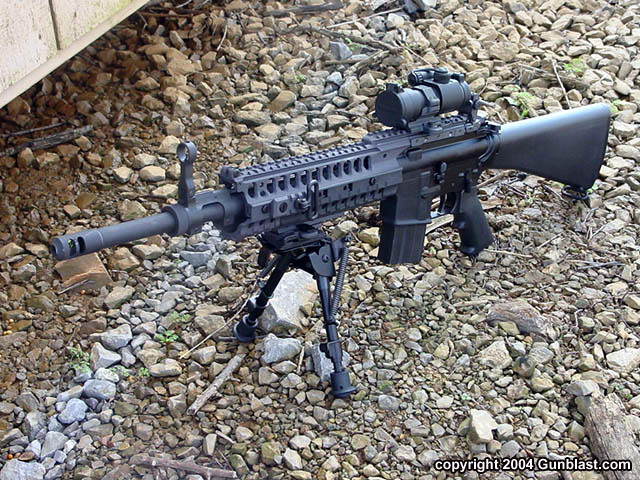 It is basically an AR15/M16/M4 rifle, with a few added features. 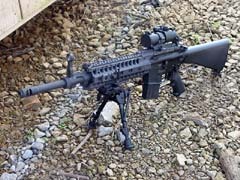 Barrett calls the new rifle the M468, and is being built in both a civilian-legal model, and also in a close quarters battle (CQB) configuration. 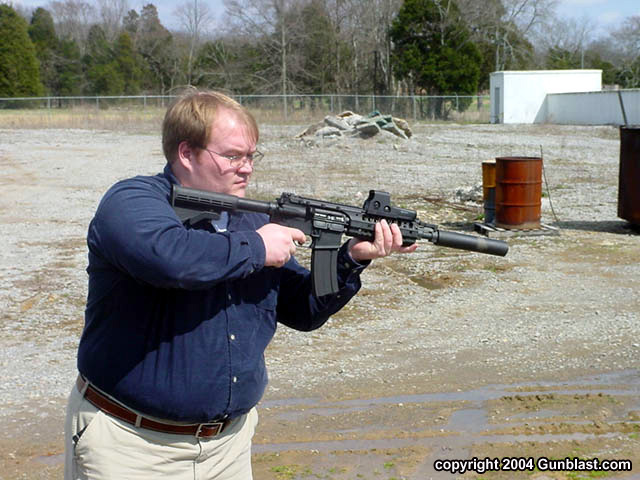 I was recently afforded the opportunity to visit the Barrett facility to evaluate and fire both basic versions of this new weapon. 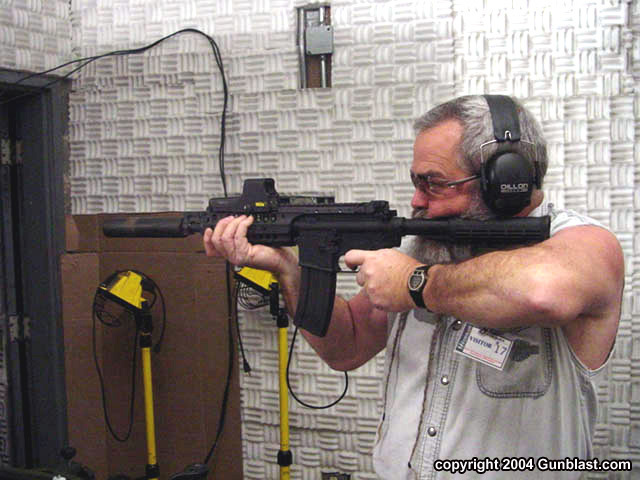 Both of the rifles tested were of flattop upper receiver configuration with excellent A.R.M.S. folding backup sights. 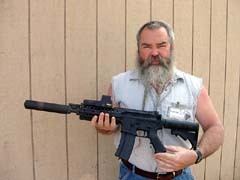 The sixteen inch barreled version was of semiautomatic operation, and employed Barrett’s two stage trigger, resulting in a very controllable trigger pull which measured a crisp three pounds and fourteen ounces on my Lyman digital scale. Both rifles wore the excellent A.R.M.S. 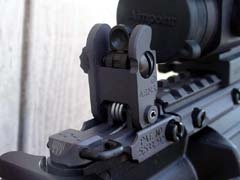 integrated rail system that allows the easy mounting of accessories such as lights, lasers, bipods, and other such devices as the user deems necessary. Both rifles wore a muzzle brake, and are threaded just forward of the gas block for a sound suppressor. 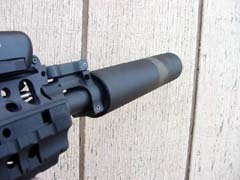 The sixteen inch version wore an A2 style buttstock, and the twelve inch barreled rifle had a collapsible CAR type buttstock, along with a Barrett sound suppressor. Firing the full-auto twelve inch CQB rifle with the Barrett can attached proved to be a very controllable package. 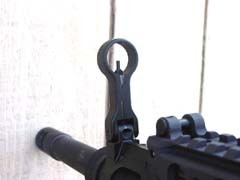 The can was very effective in reducing the sound signature from the short barrel, and the felt recoil was straight back and light. This would make for a great close range weapon for military or specialized law enforcement units. 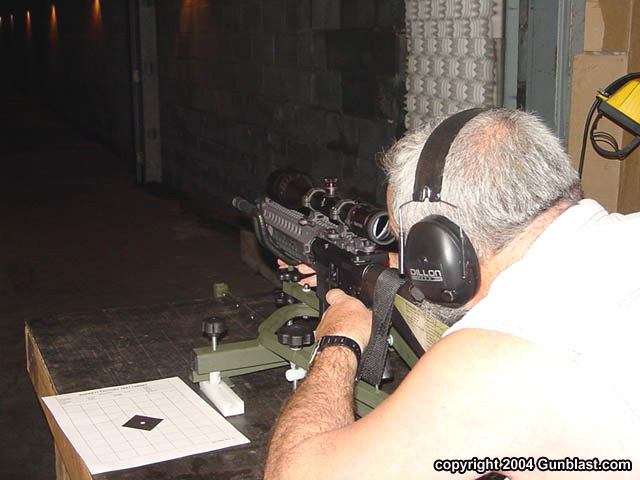 In fact, while we were visiting the Barrett factory, the leaders of a municipal SWAT team were there evaluating the M468 CQB rifle for their own needs. 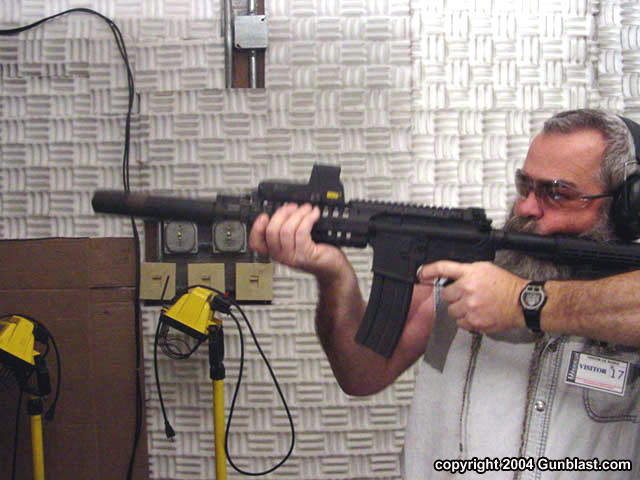 They seemed very impressed with the weapon, and the sound suppressor. 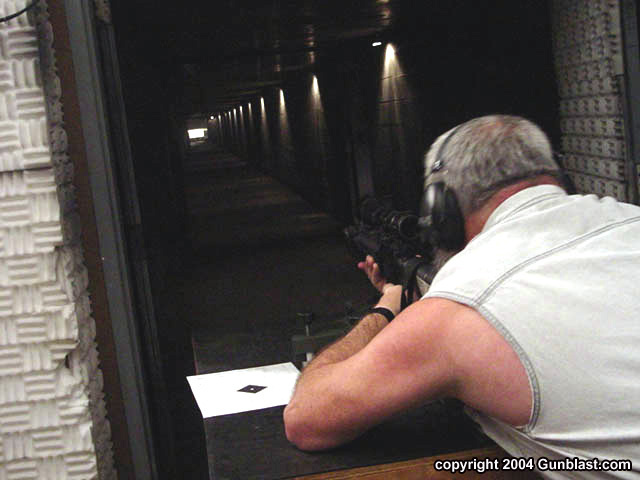 For accuracy testing, we fired a sixteen inch barreled rifle at a range of one hundred meters. 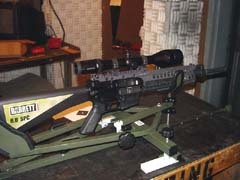 The rifle was mounted with a Swarovski target scope, and firing was done from a Lahti rifle rest. I was initially impressed with the design of the rest, but after using it, I greatly prefer my Target Shooting, Inc. Model 500 rifle rest. 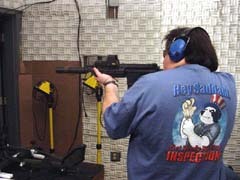 I can hold a gun much steadier with the model 500. The M468 proved capable of firing groups measuring one and one-quarter inches at the 100 meter mark, but I think that could be improved firing from a better rest. It could be that I just was not familiar with the Lahti rest, but I could just not hold the rifle consistently using that thing. At any rate, the accuracy of the M468 as demonstrated was very good, and will most likely improve as the ammunition is further developed. Functioning in both rifles was perfect, with the exception of one experimental lot of ammo that seemed a bit underpowered, and would sometimes fail to eject. Changing ammo lots corrected the problem immediately, and no further malfunctions occurred. The ammo chronographed at a speed of 2613 feet per second at a distance of twelve feet from the muzzle out of the sixteen inch barrel, which is right in line with advertised velocities. The future of the 6.8 SPC as a military cartridge has not been finalized. However, at this time there are some specialized units of the US Army putting the M468 through some serious testing. 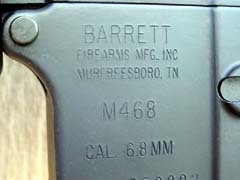 Barrett Manufacturing is working closely with the military in developing this weapon. Barrett has for many years supplied the excellent Model 82A1 to the US military and our allies, and has the ability to supply the M468 as needed. In the meantime, the M468 is in production for civilian sales, and Barrett offers complete rifles, along with upper receiver units to fit most AR15 lower receivers. Depending upon bullet construction, the 6.8 SPC should make an excellent little carbine for hunting predators and whitetail deer at reasonably close range, in a rifle with semi-auto firepower, a weight of 7.3 pounds, and an overall length of only 33.5 inches. With the proper bullet, the M468 offers plenty of power for deer hunting, along with good accuracy and light recoil. 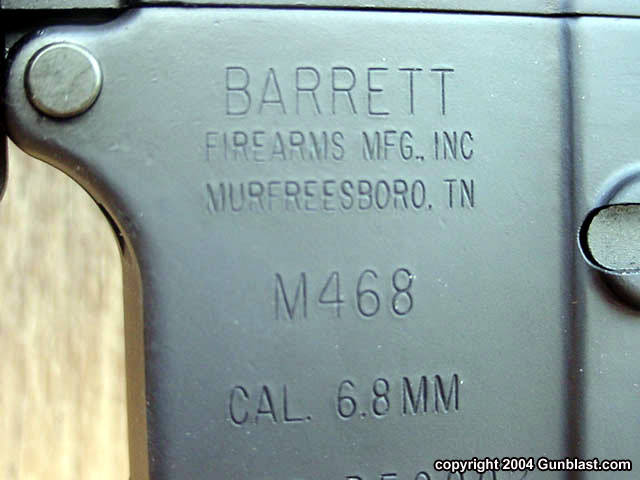 In the M468, I believe that Barrett has another winner on their hands. Check out the M468 and the entire lineup of Barrett rifles online at: www.barrettrifles.com. Barrett M468 with 16" barrel. M468s as tested were equipped with A.R.M.S. folding backup sights. M468 with 12" barrel and Barrett's excellent sound suppressor. 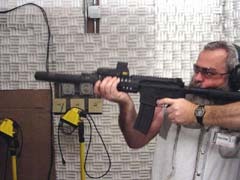 Barrett's suppressor design is effective, quick to attach or detach, and does not "shoot loose". 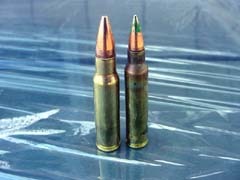 6.8 Remington SPC (left) alongside the 5.56mm NATO cartridge. 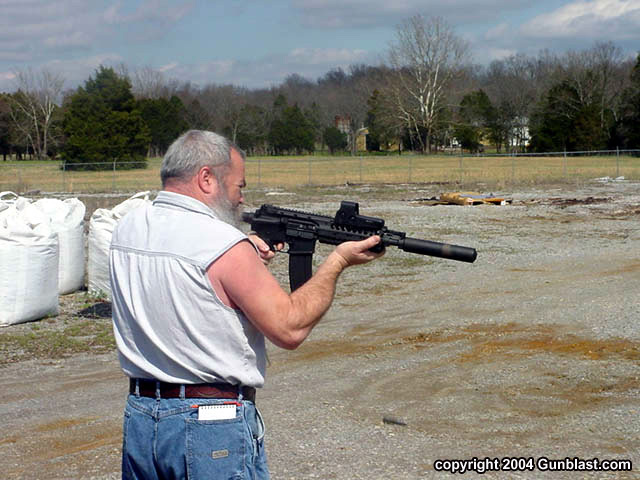 Chris Barrett (top) and the author (bottom) testing the 12" suppressor-equipped M468 in full-auto mode. 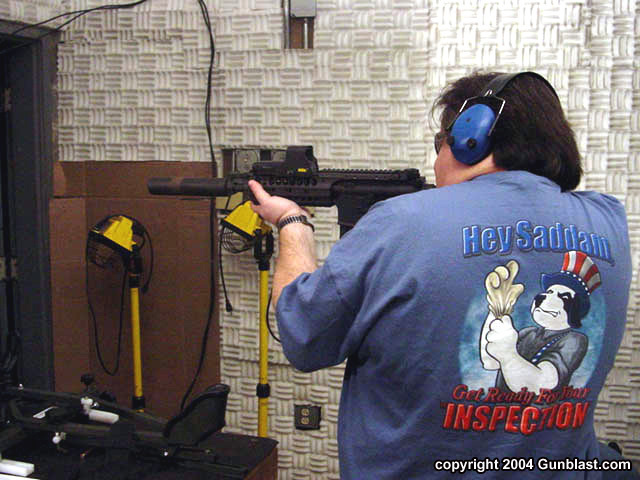 Jeff tests the M468 for accuracy at Barrett's indoor 100-meter range. 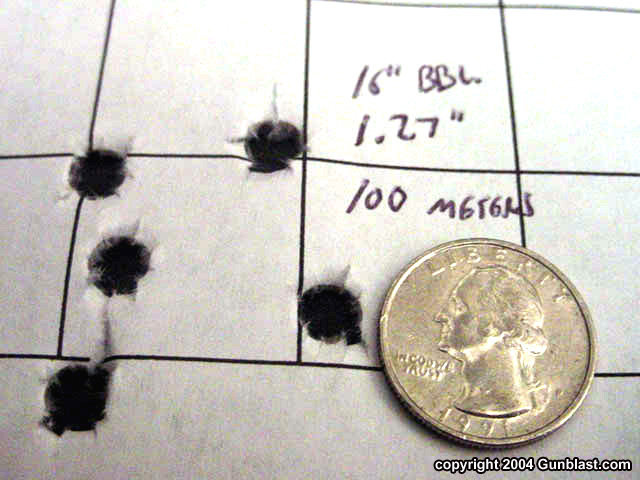 The M468 and the 6.8 Remington SPC proved to be capable of acceptable accuracy. Jeff believes this gun/cartridge combination will prove even more accurate as ammunition development continues. Jeff and Boge fire the suppressor-equipped M468 in full-auto mode at the indoor range. 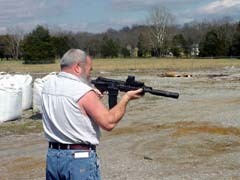 The gun proved to be very manageable under recoil. The Barrett M468 delivers much more terminal effect than the 5.56mm NATO with good accuracy in a handy size, and should find favor with military, police and civilian shooters. Barrett has another winner on their hands!